Chakrabarti, S., Pal, S., Biswas, B., Bose, K., Pal, S., Pathak, S. (2016). Clinico-Pathological Study of Cutaneous Granulomatous Lesions- a 5 yr Experience in a Tertiary Care Hospital in India. Iranian Journal of Pathology, 11(1), 54-60. Srabani Chakrabarti; Subrata Pal; Biplab Biswas; Kingshuk Bose; Saswati Pal; Swapan Pathak. "Clinico-Pathological Study of Cutaneous Granulomatous Lesions- a 5 yr Experience in a Tertiary Care Hospital in India". 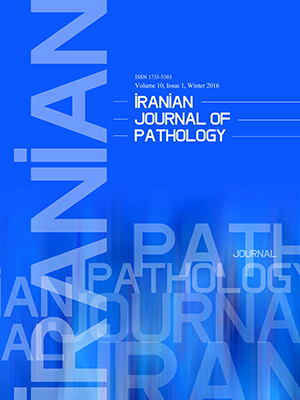 Iranian Journal of Pathology, 11, 1, 2016, 54-60. Chakrabarti, S., Pal, S., Biswas, B., Bose, K., Pal, S., Pathak, S. (2016). 'Clinico-Pathological Study of Cutaneous Granulomatous Lesions- a 5 yr Experience in a Tertiary Care Hospital in India', Iranian Journal of Pathology, 11(1), pp. 54-60. Chakrabarti, S., Pal, S., Biswas, B., Bose, K., Pal, S., Pathak, S. Clinico-Pathological Study of Cutaneous Granulomatous Lesions- a 5 yr Experience in a Tertiary Care Hospital in India. Iranian Journal of Pathology, 2016; 11(1): 54-60. 1Dept. of Pathology, College of Medicine and Sagore, Dutta Hospital.Kolkata, India. 3Dept. of Pathology, NRS Medical College, Kolkata, India. 4Dept. of Pathology, Calcutta National Medical College, Kolkata. India. Background: Granulomatous dermatoses are common skin pathology, often need histopathological confirmation for diagnosis. Histologically six sub-types of granulomas found in granulomatous skin diseases- tuberculoid, sarcoidal, necrobiotic, suppurative, foreign body & histoid type. The aims of the present study were clinico-pathological evaluation of granulomatous skin lesions and their etiological classification based on histopathological examination. Methods: It was a five years (Jan 2009- Dec 2013) retrospective study involving all the skin biopsies. Detailed clinical and histopathological features were analyzed and granulomatous skin lesions were categorized according to type of granuloma & etiology. Special stains were used in few cases for diagnostic purpose. Results: Among 1280 skin biopsies, 186 cases (14.53%) were granulomatous skin lesions with a ratio 1:24. In histopathological sub-typing, tuberculoid granuloma was most common type (126 cases, 67.74%). Most common etiology of granuloma in the study was leprosy (107 cases, 57.52%). Other etiologies were cutaneous tuberculosis, foreign body granulomas, fungal lesions, cutaneous leishmaniasis, sarcoidosis and granuloma annulare. Conclusion: Histopathology is established as gold standard investigation for diagnosis, categorization and clinico-pathological correlation of granulomatous skin lesions. Chakrabarti S, Pal S, Biswas B, Bose K, Pal S, Pathak S. Clinico-Pathological Study of Cutaneous Granulomatous Lesions- a 5 yr Experience in a Tertiary Care Hospital in India. Iran J Pathol 2016; 11(1):54-60. Gautam K, Pai RR, Bhat S. Granulomatous lesions of the skin. Journal of Pathology of Nepal. 2011;1(2):81-6. Pawale J, Belagatti SL, Naidu V, Kulkarni MH, Puranik R. Histopathogical study of cutaneous granuloma. Ind J Public Health Res Develop 2011 July;2(2):74-9. Qureshi R, Sheikh RA, Haque AU. Chronic granulomatous inflammatory disorders of skin. Int J Pathol 2004; 2(1):31-4. Zafar MNU, Sadiq S, Menon MA. Morphological study of different granulomatous lesions of the skin. J Pak Assoc Dermatol 2008;18(1):21-8. Dhar S, Dhar S. Histopathological features of granulomatous skin diseases: an analysis of 22 skin biopsies. Indian J Dermatol 2002;47(2):88-90. Bal A, Mohan H, Dhami GP. Infectious granulomatous dermatitis: a clinico-pathological study. Indian J Dermatol 2006;51(3):217-20. Hirsh BC and Johnson WC. Concepts of granulomatous inflammation. Int J Dermatol 1984 March;24 (2):90-9. Young RJ 3rd, Gilson RT, Yanase D, Elston DM. Cutaneous sarcoidosis. Int J Dermatol 2001 April;40(4):249-53. Khan Y, Anwar J, Iqbal P, Kumar A. Cutaneous tuberculosis: a study of ten cases. J Pak Asso Dermatol 2001;11(3):6-10. Yasmeen H, Kanjee A. Cutaneous tuberculosis: a three year prospective study. J Pak Med Assoc 2005 Jan;55(1):10-2. Kumar B, Muralidhar S. Cutaneous tuberculosis: a twenty year prospective study. Int J Tuberc Lung Dis 1999 Jun;3(6):494-500. Puri N et al. A clinical and histopathological profile of patients with cutaneous tuberculosis. Int J Dermatol 2011; 56(5):550-2. Farina MC, Gegundez MI, Pique E et al. Cutaneous tuberculosis: a clinical, histological and bacteriologic study. J Am Acad Dermatol 1995 Sep;33(3):433-40. Kumar B, Rai R, Kaur I, Sahoo B, Muralidhar S, Radotra BD. Childhood cutaneous tuberculosis: a study over 25 years from northern India. Int J Dermatol 2001;40(1):26-32. Saha J, Basu AJ, Sen I, Sinha R, Bhandari AK, Mondal S. Atypical presentation of rhinosporidiosis: A clinical dilemma? Indian J Otolaryngol Head Neck Surg 2011 July;63(3):243–6. Arseculeratne SN. Recent advances in rhinosporidiosis and Rhinosporidium seeberi. Indian J Med Microbiol 2002;20(3):119-31. Mohan H, Bal A, Dhami GP. Non-infectious granulomatous dermatitis: a clinicopathological study. J Cutan Pathol 2006;33(12):767-71.